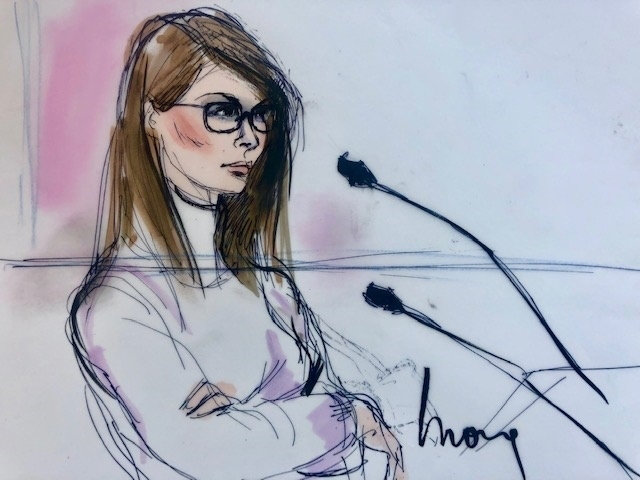 Lori Loughlin appeared defensive as she faced a judge on Wednesday, March 13, after she was taken into custody for her alleged involvement in a nationwide college admissions scam. Loughlin’s appearance in court was depicted in a courtroom sketch by Mona Shafer Edwards. The Full House alum, 54, wore a light-colored turtleneck sweater, black glasses and kept her hair down and straight as she sat before a judge for her hearing. In the drawing, her arms are crossing tightly over her chest. The Fuller House actress posted $1 million bond on Wednesday, hours after she was taken into custody, and was ordered to surrender her passport by December 2019. She will still be allowed to travel within the United States and parts of Canada due to work commitments. Loughlin and her husband, Mossimo Giannulli, allegedly “agreed to pay bribes totaling $500,000 in exchange for having their two daughters designated as recruits to the USC crew team — despite the fact that they did not participate in crew — thereby facilitating their admission to USC,” according to court documents obtained by ABC News. Giannulli, 55, was arrested on Tuesday, March 12, for his alleged involvement and also posted $1 million bond. A warrant for the When Calls the Heart actress’ arrest was issued on Tuesday as well, but she was out of the country at the time. The couple’s daughters, Bella, 20, and Olivia, 19, both currently attend the University of Southern California. USC Media Relations told Us Weekly in a statement on Wednesday that the girls could be expelled from the university in the wake of the scandal. “We are going to conduct a case-by-case review for current students and graduates that may be connected to the scheme alleged by the government,” the statement read. “We will make informed, appropriate decisions once those reviews have been completed. Some of these individuals may have been minors at the time of their application process.” Olivia, who is a popular YouTube star, was reportedly aboard USC’s Board of Trustees Chairman Rick Caruso’s private yacht at the time her parents were indicted. Actress Felicity Huffman is another celebrity who was arrested for her alleged connection to the scheme, which involved nearly 50 people. The Cake actress, 56, was reportedly met at her home at 6 a.m. on Tuesday by several armed FBI agents and held on $250,000 bond. Her husband, William H. Macy, supported her at her court hearing before she was released hours later.